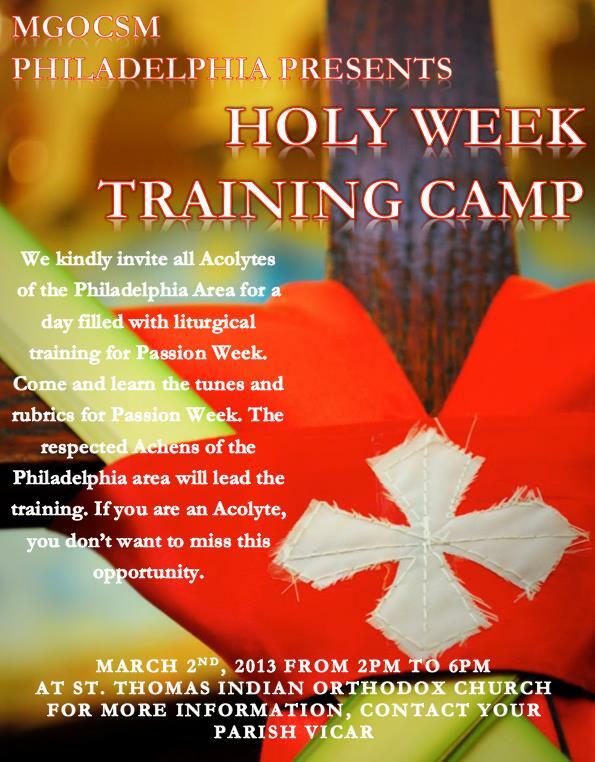 This coming Saturday, March 2nd, in the afternoon from 2pm to 6pm is the first Philadelphia area's altar servants conference titled, Holy Week Training Camp. It will be held at St. Thomas Indian Orthodox Church, 1009 Unruh Ave, Philadelphia, PA 19111. It is a conference aimed towards more of an educational purpose for the area's altar servants on the purpose, meaning and liturgical significane in all our services during Holy Week. The plan is to go over the meaning and purpose of each's days services and songs that are performed, namely that of Palm Sunday, Pesaha, Maundy Thursday, Good Friday and Easter. Along with this the altar servants will be trained in the rubrics of what to do at what time and why to do that particular duty at those times. Lastly the tunes of the liturgical services will be refreshened keying on the main songs of the services. All the sessions will be led by Rev. Fr. Aju Philip Mathews. Even though this conference is set focused primarily on the altar servants of the area, everyone is welcome to come. If anyone would like to learn more about what we do exactly during Holy week or why we do certain things during that week, please do come and be educated. Our Achens are here to use if we have questions about our liturgical services, this is the time to ask. Again this conference is open to all who would like to learn more or understand better the liturgical services' purposes, rubrics and tunes for Holy Week.